I’ve always been interested in all these funny asian beauty things but never had a chance to try them out. But when I got it, I’ve decided to go for some safe yet useful options. Both items come from Bornprettystore. Let’s have a look? I’ve always wanted to have one of these as I oh boy, I do LOVE lipsticks. 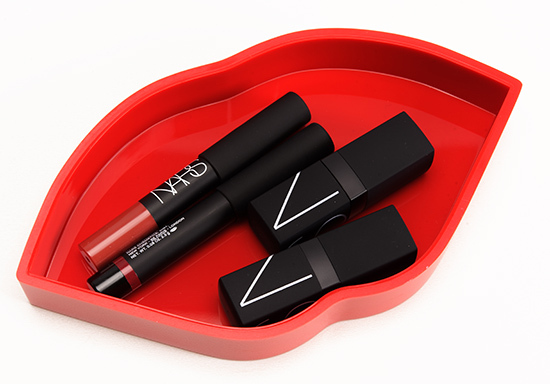 I used to keep my seasonal favorites right on my table and the other ones in NARS Guy Bourdin Fling Lip Kit box, but at some point my lipsticks were pretty much everywhere. I went for the holder which is designed for 24 lipsticks. I think I don’t have 24 lipsticks yet but you never know. Am I satisfied with this organizer? Totally. Classic, clear, well-made, simple, cheap, it keeps everything in place and lets you enjoy the breathtaking view of your gloriously organized lipstick collection. Adieu, the mess. My funny love from the first sight. These Born Pretty hand creams come in a shape of apple, pear, lemon and peach. I chose the lemon one as I thought that nobody but me would choose it. The packaging is rather big (almost 8 cm/3 in) and very well made, the smell is subtle and nice. Honestly, I wasn’t expecting much from a hand cream in a shape of a lemon, but I was wrong. Surprisingly, the cream itself is rather thick and feels like a balm. It gets absorbed within 30 seconds and leaves your hands super soft. I’m experiencing all the drama of cold Russian winter right now, and this cream is a savior. It moisturizes, nourishes, calms down irritations, looks adorable on my vanity table and costs less than a cup of coffee. What a winner. On the website! I know, Bornprettystore can look a little bit random (Random, haha! Got it?) to some of you, but I’ve tested it out and approved. So far so good. I even feel a little bit hooked as I need other little fruit creams now. And a smaller makeup holder for my other table. And a lipgloss in a form of cupcake. I have 10% discount code. It’s MGAH10. I will be happy if it comes in handy if you want to get yourself something funky, useful/useless and totally cute. This hand cream is so cute! I really need to invest in some storages for my makeup! Haha I’d love to have a smaller one as well! I love that hand cream. So unique! Thank you for sharing this with us. Visit me http://www.its-dominica.blogspot.co.uk whenever you can. Enjoy the rest of your day, Dominica S.
Oh it’s real good and cheap as hell haha! oh my goodness girrrrrl that lemon cream is SOOO cute! love how unique it is and I’m so happy to read that it actually works pretty awesomely too yaaaay. I love bornprettystore, the selection they have is fantastic! Oh my gosh that lipstick holder is such a simple, yet fantastic invention! I definitely need to get one of them!